​We are pleased to offer an exciting array of workshop opportunities at the 2019 Biggest Week In American Birding! Use the drop-down menu at the top of the page, or click one of the categories to the right, to learn more about our various workshop offerings. 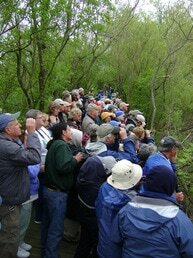 Bird ID Workshops - These workshops are focused on identifying specific groups of birds, like warblers or shorebirds. Birding Skills Workshops - These workshops are focused on birding and identification techniques that are applicable to all types of birds. Sketching and Writing Workshops - Get in touch with your artistic side, and appreciate birds in a whole new way! ​Photography Workshops - ​Always popular with festival attendees, these workshops will help you develop your bird photography skills.